Socrates, as we all know, was a famous classical Greek philosopher who lived over 2,000 years ago. Primarily through the writings of Plato we have learned about his contributions to how we think about ethics, good vs. bad, and justice. But more specifically, he championed a problem-solving technique that has become known as the Socratic Method. The Socratic Method is a system of conversation through which a series of questions lead to a series of answers that ultimately help solve a larger problem or answer a larger question. I recently read a book called “Socratic Selling” written by Kevin Daley that applies the teachings of Socrates to selling more effectively. The general thesis is that by engaging with the customer, asking questions about the true need the customer has, listening to the answers, and then tailoring a mutually beneficial solution based on those answers, everybody can win. Below are a few of my key take-aways, but I encourage you to read the book and see what you get from it. We all know “sales people.” They are confident, extroverted, and (generally speaking) like to talk. They like to talk about their ideas, their company, and usually themselves. There is obviously nothing fundamentally wrong with talking, but the timing of when the sales person opens their mouth is important. Kevin asserts that sales people often talk far too much at the outset of a business relationship before they have even invested any time into listening to what their customer’s actual issues and needs are. Sales people may like to talk and argue a position, but, absent a true understanding of the problem, they are potentially completely missing the mark in terms of what the customer wants. The book argues that the customer has given you their time and in return they really do want to be heard! By applying the teachings of Socrates, we can learn to ask questions that enable us to drill down to the heart of any issue. Let your customer talk about what they want and what keeps them up at night. Repeat back to them what you heard to make sure you understand and to show them that you are listening. 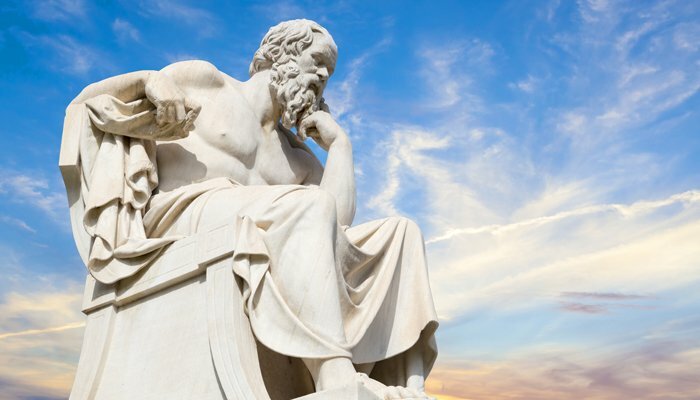 The Socratic method shapes the dialogue based on their answers to your questions and by requiring that you take each answer seriously and consider it thoughtfully. A healthy dialogue is less taxing on the sales person, develops a better relationship with the potential customer, and lays the foundation for a mutually beneficial business relationship. The Socratic method that Kevin describes takes the customer through a series of questions and answers that lead to a very logical conclusion. It doesn’t leave the customer feeling like, as Kevin puts it, that they are being forced to make “one big yes or no decision.” It’s a journey of discovering the customer’s problems, asking questions, and being very aware of their answers. The result of this is that everybody wins – and both parties know it and can feel comfortable. It’s OK for you to benefit as a seller too (and admit it!) – customers realize that when your business succeeds it enables you to invest, innovate, and bring even better solutions the next time around. Positioning the sale as a partnership to work together towards a common goal promotes trust and an on-going working relationship that is less awkward and more enjoyable. The buyer, or the “lion” as Kevin puts it, is in charge but they have a problem to solve and the stress doesn’t solely reside on the seller’s “side of the table.” The buyer has a need, is under pressure to make the right purchase, and is accountable for any bad purchasing decisions that they make. As Kevin reminds us, corporate buyers used to be able to, figuratively speaking, “nap” their way through their career and hide their purchasing mistakes. But now, everything is visible and transparent. In many ways, the buyer has more at stake than the seller. If the product doesn’t do what it’s supposed to do, or the service fails to deliver, the seller can move on to the next sale, but the buyer will be asked, “Who’s idea was it to go with XYZ?” or “Why did we buy this?” A wrong decision around the purchase of a key component, or a key business partner, could introduce a lot of unnecessary risk and jeopardize careers. When I was in the corporate world I used to joke that, “now I have to eat what I cooked,” because I knew what it meant to be accountable for my decisions. A seller that can place themselves in the shoes of the buyer, and ask questions to really understand the problem, in order to create a tailor-made solution, will have the perspective and insight to more fully appreciate what the potential customer has at risk. The book ends with techniques to negotiate and close the sale. Again, Kevin describes how to do this in a “Socratic” way that is much more comfortable and natural than saying, “OK, so will you sign on the line which is dotted?” If you’re looking for a slightly counter intuitive how-to primer on selling, Kevin’s book is a useful, quick read. He reminds us that the fundamental motivations and behaviors most of us share have been with us for thousands of years and are not likely to change anytime soon.